After a long pirate career, Captain Henry Morgan gets appointed Governor of Jamaica. He’s tasked with ridding the Caribbean of pirates. Instead, Morgan invites his former colleagues to join him in retirement. He institutes a race around Jamaica, where each pirate ship can loot and pillage at their leisure. The first one to make it around the island first, wins. We’ll get to the race in a little while but first, we have to plunder the technical bits. 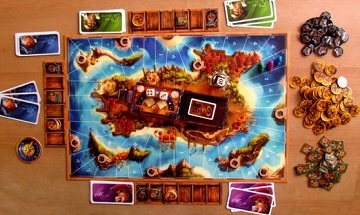 Each player has a hand of three cards and a board depicting the five “holds” of their ship. Each card has two symbols, representing actions, one on the left and one on the right, which you perform on a turn. Players store goods in their holds, and each good serves a purpose. Food provides sustenance for your crew and lets you move from space to space. Gold allows you to pay port costs (also allowing to sometimes) and counts as victory points. Cannonballs beef up your ship’s attack. On a turn, one player is designated as “captain,” and the captain rolls two normal D6 dice (six-sided dice that number 1 through 6). 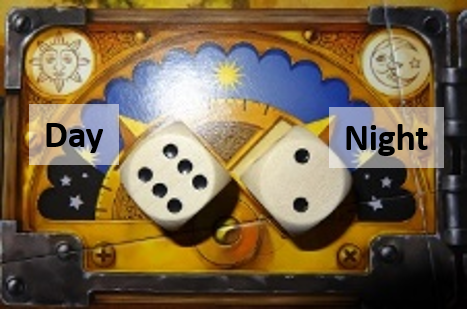 After they roll, the captain arranges the dice in an area on the board labeled “day” and “night.” Each player simultaneously selects a card from their hand and places them face down in front of them. Your “day” action is on your card’s left, while your “night” action is on the right. You have to do everything you can do on your card. For example, if the captain rolls a six and a two, places the six on “day” and the two on “night,” whatever action is to the left on your card you do six of and then you do two of whatever action is on the right. Let’s say that I play a card that has “food” for the day action and then “move forward” for the night action. I would gather six food from the bank and then move forward up to two spaces (however many spaces I can move forward up to two that I can pay for with food). 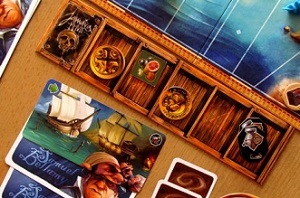 A turn starts with the captain resolving their actions first, followed by the player to the captain’s left until everyone gets a turn. 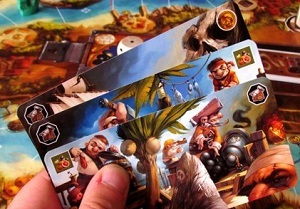 Once everyone’s cards are resolved, the player to the captain’s left becomes the new captain, and the next turn begins. There are two uncommon occurrences on a turn: treasure and combat. If a player lands on a treasure space by exact count during one of their turn’s actions, they earn a treasure card. These cards can give you combat bonuses, grant you extra victory points, or even increase your ship’s cargo hold. If you land on another player by exact count, the two players fight. You roll a special D6 (a six-sided die with odd numbers on it, except for one automatic win face) and players can add cannonballs to their roll to improve their chances. The winner steals a treasure or goods from the loser, and in the case of a tie, nothing happens. Play continues until someone crosses the finish line. Players finish their turn—if they haven’t taken them before the player crosses the finish line—and you tally victory points to find the winner. I love Jamaica. It has elements that remind me of board games past but it etches its own path at the same time. 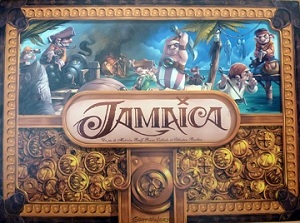 Jamaica works as a great gateway game, a game that’ll get non-gamers into tabletop games. It’s fast and easy-to-learn, and that’s a good thing because it’s also gorgeous. 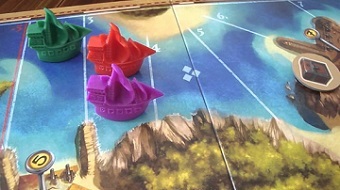 I’ve taken Jamaica to gaming groups and it attracted onlookers because of its sleek appearance, but people stayed around the table because of how well the game plays. And who doesn’t like playing a pirate? I do have one small gripe and you might guess what it is based on the game flow. At its heart, Jamaica is a racing game but the winner is determined by victory points. You can earn victory points by collecting treasure, cashing in your doubloons, and by how far you went around the island. You earn 15 points for passing the finish line and the point value decreases the farther you are from the finish line until you reach a red line on the board. If you’re on the wrong side of the red line, you get negative points. While I’ve never seen anyone win—yet—that received negative points from the distance they traveled (or didn’t travel), the winner of the race seldom wins the actual game. The winner is usually someone hanging back a few spaces from the finish line with a heap of doubloons and some high point value treasure. Still, Jamaica’s a wonderful game that you have to try at least once. A fantastic game by Bruno Cathala, Jamaica provides a beautiful experience.